Why Buy a CD these days? Of course, this CD’s audio tracks are the source of our audio Course, available free, right now, right here. So, why have a CD? There are still a lot of good reasons a person or, especially, groups would want the CD even though all the audio is presented in the online course that plays beautifully right from your smartphone. Our book, also available for sale here, is designed to be standalone. It works in print for those who only read. But there are delicate parts of that Course which would be better done by listening, especially to have a skilled teacher guide you. Of course, that kind of guidance is now available in our free online audio course. But it was not available when we printed the book in 2007. So the book mentions how to best combine the CD with the reading. The two were designed together and complement each other in a skillful and also an aesthetic way. They go well together in any library, home or public. DO HAVE a CD player hanging around, or a loving friend can still buy one for a few dollars. The CD, like all audio CDs, runs all the way through if you let it. 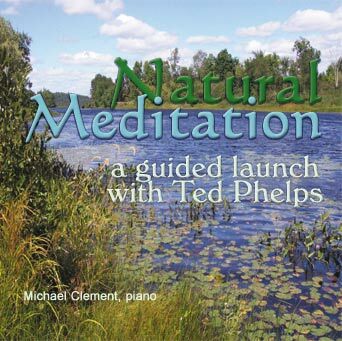 While the program has a few places that allow the listener to take a break, it also works well–and probably works best–when the learner just gets settled in a good chair and lets the CD go right through the full 72 minutes. In a group setting, a leader can set up a CD to play from the start for an introductory session, or play certain tracks, such as the 15-minute meditation, for experienced people getting together. You can do that with the online course, too. But isn’t a CD a bit more stable feeling for doing a group event? We think so. Wrap it Up. What a gift! As we all know, even today, audio CDs make good gifts. They contain so much in such a small package. You can’t wrap up and give anyone our free online audio course, although you can give them your presence and thoughtfulness in offering to visit them and show them the course, maybe on their smartphone. But a little square packet (this CD) wrapped with love, does something that only objects can do. It can even sit around on their desk or breakfast table, waiting to be used, and each time they see it, they remember you, your love, and that reminder that “meditation is waiting” and it is good and can be completely natural. We might as well be the ones to say it: When these CDs are gone, they won’t (likely) be produced again by Windless Place publishing. Books will no longer be sold with the CDs, much less with the great option we have now of getting the CD basically for free. Just sayin’. 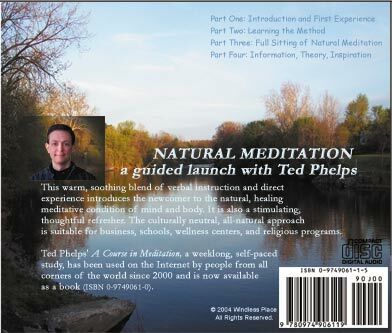 Settle back in a quiet place, perhaps with a friend, and receive step-by-instructions from Ted Phelps, the designer of the respectful, non-religious teaching method called Natural Meditation. The 72-minute program gives hands-on practice, including a 15-minute silent meditation timed for you right on the CD. When you come back, there’s still time for 23 minutes of follow-up information. This audio instruction teaches the skill of Natural Meditation in a way that complements the book version of A Course in Meditation. It is also a stimulating, thoughtful refresher for those who have meditated before. The culturally neutral, all-natural approach is suitable for business, schools, wellness centers, and religious programs.